The film start with an elderly Daisy (Cate Blanchett) ask his daughter, Caroline (Julia Ormond) to read a diary written by a special person named Benjamin Button (Brad Pitt). As Caroline narrates the story, you will already witness the most odd case in human medical history. Benjamin Button is born with an appearance of an 86 year old man in year 1918. Thrown away by his father and taken by an afro-americam couple, Benjamin spends most of his early life on a wheelchair like the elderlies on their home. But this doesn't stop the young (but physically old) Benjamin to discover new things. So he strive to look for answers and eventually found out things about the world around him and the amazing truth that he is not growing old but he is actually growing young. Brad Pitt (left) stars as Benjamin Button and Cate Blanchett (right) stars as Daisy in "The Curious Case of Benjamin Button." Benjamin (Brad Pitt) while playing his toys oldiers. At this moment, Benjamin's journey in looking for his place in the soceity begins. But little did he know that his gift also holds a destiny that he and the people around him can't imagine. The story is interesting. I became very curious about the movie the moment I saw the trailer. But I thought the movie is based on a real story. The medical condition portrayed in the movie is purely fictional but can resemble some illness that concerns premature aging. Their are parts of the movie that drags me a lot and I came to some scenes that I almost got bored. But I look forward to every scene when he transforms and I enjoy comparing his appearance to most people around him who ages normally. Brad Pitt did very well in this film but not as good as his previous performance in Babel. Cate Blanchett on the other hand didn't fail to amaze me on how she performs his characters in different levels and age. To sum it up, This film is worthy of your money for a very substantial and interesting script and story. The movie also inspires everyone to live their life to the fullest for time can't really go back. The movie can touch everyone's heart and also can tickle your funny bones in some scenes. 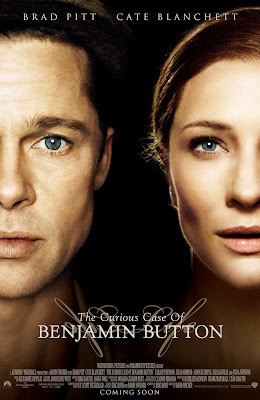 I'm recommending The Curious Case of Benjamin Button to everyone who long for a movie that tackles something new and somehow weird. The movie will premiere this coming January 8 , 2009 nationwide. Thanks to Warner bros. and Azrael for inviting us to the advance screening. I love it! ibang iba ang story! panalo!